Email to Sherry Faye Rodarmor From Craig Campbell Subject CH Shefaro Shaman Friday, September 8, 2000 "Nine shows, seven BOB, two group seconds, one group third, three group fourths. 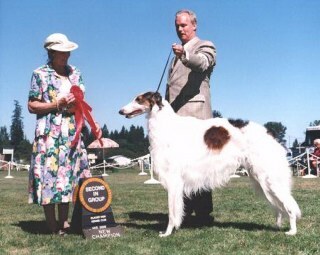 Probably in the top ten Borzoi in Canada, number one Borzoi in British Columbia, in the top two hounds on Vancouver Island, with one more show to go this season, where I fully expect him to get a group first placing and Best in Show so he has one of everything! I don't know why dog show people are so uptight. There's nothing to this dog show thing. You just have to buy the best. Update on Shaman: He didn't get his group first or best in show this time, but he finished out the year with three more Hound Group Seconds! Nice way to start and finish!